Ultraviolet (UV) curing is a process that uses ultraviolet light to cure (solidify) liquid inks, coatings, or adhesives to create a protective, scratch-resistant coating on products. UV curing costs less, reduces waste, improves gloss, and creates better scratch resistant surfaces. Liquid ink or other material is exposed to UV light which causes photopolymerization. Photopolymerization is polymerization under the influence of radiant (light) energy. Polymerization is when two or more molecules combine to form larger molecules. This process turns the liquid ink or adhesive into a solid. This creates a protective coating on the product. UV curing can treat any heat-resistant material such as wood, plastic, and glass. 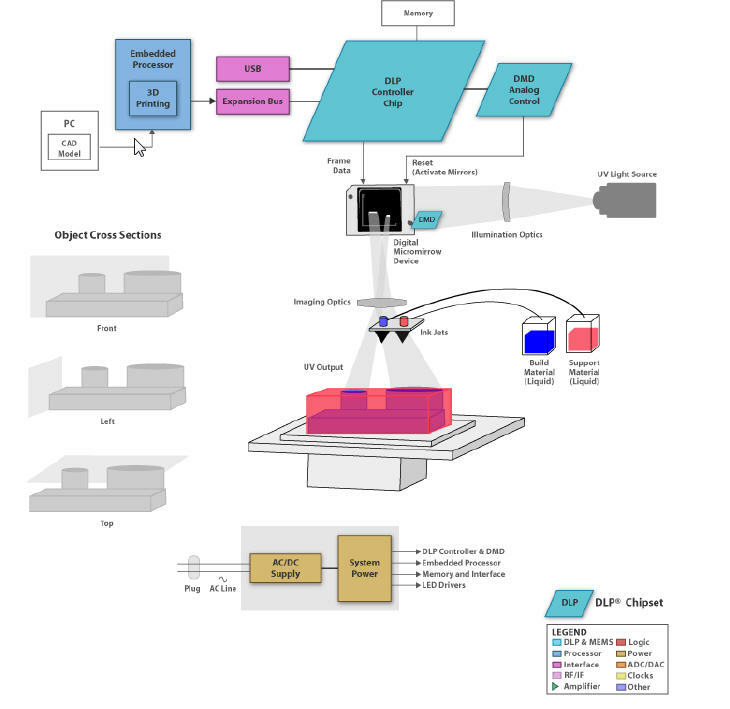 Digital Light Processing (DLP) 3D printers use ultraviolet light to print out 3D objects. The 3D model is sent to the printer where an ultraviolet image of the model is projected onto a vat of liquid. The liquid hardens where the light hits it (photopolymerization) and the vat is drained layer by layer, revealing the solidified part. There are several DLP 3D printers on the market, such as the MiiCraft, Formlabs, and 3D systems. Chuck Hull, the founder of 3D Systems, has a patent on stereolithography, which uses DLP and UV curing as a process.